An Automated External Defibrillator (AED) is an extremely invaluable tool to use in the event of a cardiac arrest and can certainly be the difference between life and death for the victim. The basic function of an AED is to deliver a life-saving shock to the heart of the victim in order to get it beating on its own again. However, an AED will be most effective if used within a few minutes following the cardiac arrest. Thus, knowing how to use the AED ahead of time and having it readily available are very important factors in a successful rescue. How do I know the person is in cardiac arrest? A person in cardiac arrest will not be breathing normally. This is a sign that the heart has stopped beating. If a person is experiencing agonal respirations, this is considered abnormal breathing and is actually a sign the heart is not beating (cardiac arrest). 1. Apply the AED pads. Quickly. 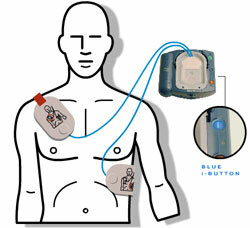 AED pads must be placed directly on a bare and dry chest. There should be a small kit that comes with the AED containing a pair of scissors, razor and towel/cloth. These must be used first in that order. Remove all clothing away from the chest using the scissors to cut straight up the middle of the garments covering their chest. Next, use the razor (if necessary) to shave any hair away from the locations where the pads will be placed. Lastly, dry any moisture from the chest using the towel/cloth. The pads will then be placed diagonally across the chest. Simply follow the diagram on the pads as to where they should be placed. For an adult, one pad will be applied on the right side of the chest and the other on the left side of the lower ribcage. For a child or baby, one pad will be placed in the centre of the chest and the other in the centre of the back. See below. The pads must have a minimum spacing of approximately 2.5 cm or 1 in. Same goes for clearance from an implanted medical device such as a pacemaker. If you see a scar with a raised lump under the skin, assume it to be an implanted medical device. 2. 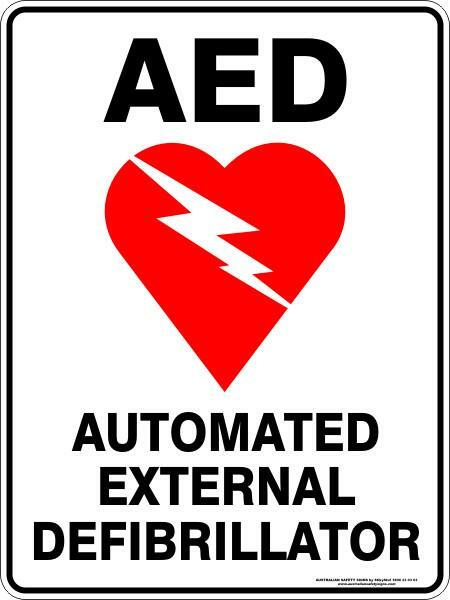 Turn on the AED. During "Analysis" the AED is checking to see if, in fact, the person's heart rhythm is shockable. The AED will tell you not to touch the victim. Wave your hands over them and say aloud, "Everyone clear!" It is important nobody is touching the victim at this stage as it is possible the AED picks up that person's heart rhythm, prompting a "No shock". After analyzing the victim's heart rhythm, the AED will either prompt, "Shock advised" or, "No shock advised". If a shock is advised the AED will then either begin counting down from 3 (fully-automatic AED) or prompt you to press the shock button (semi-automatic AED). The fully-automatic AED will provide you 3-seconds to stand clear and then deliver the shock itself. Be sure to, once again, wave your hands over the victim and say aloud, "Everyone clear!" Alternatively, the semi-automatic AED will prompt you to, "Press the shock button now." Press the button immediately after waving your hands over the victim and saying, "Everyone clear!" Once the shock has been delivered, the AED will prompt you to begin CPR. Begin CPR immediately and continue until the AED tells you to stop. 3. Continue CPR following the AED's prompts. The AED will prompt you through your CPR cycles. Some AEDs provide more feedback than others. All AEDs will beep at the rate at which you should be delivering chest compressions, this is a standard feature. Some AEDs will also provide feedback as to whether or not you are pushing hard enough. Listen to these prompts and continue doing what the AED is saying. After 2 minutes of CPR has elapsed, the AED will, once again, go back through the steps of analysis, shock or no shock and then prompt you to perform CPR. Continue following these prompts until either the person is breathing normally or EMS arrive and take over.